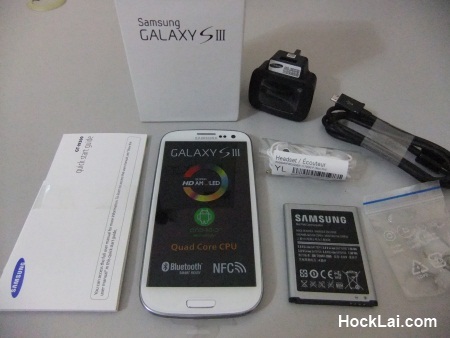 The 3rd generation of Samsung flagship Android smartphone – the Galaxy SIII. At first glance, the new Samsung Galaxy S3 is all about sleek curves and the gorgeous 4.8 inch SuperAMOLED screen. The Hyperglaze coated glossy plastic of the Galaxy S3 gives it a nice finish, but I personally prefer the more solid feel of the HTC One X than the all-plastic build of the Samsung Galaxy S3. The Samsung Galaxy S3 comes in a minimalist box that greets you with the phone upon unboxing. The rest of the contents in the box is pretty standard, a pair of earphones, charger with a microUSB cable, and a little manual. I liked the idea of the USB charger with a detachable cable that can also be use for data transfer. But perhaps Samsung could have given a longer cable as it hardly makes it from my wall plug to my desk where I normally place my phone while charging. 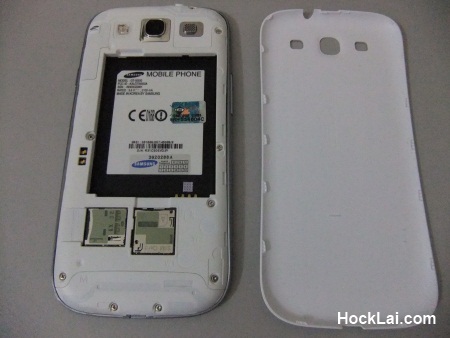 A case of overzealous cost cutting on a premium phone? For more specifications details, refer here. Looking at the specifications, it’s pretty top-notch and well equipped with the best hardware possible for a 2012 smartphone. The 1.4GHz Quad-core processor will be ever ready to crunch all the tasks quickly and smoothly. 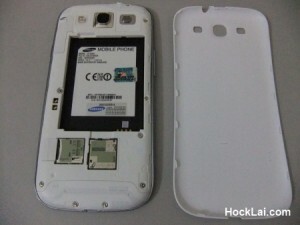 But what caught me most is the 2100mAh battery which is probably the highest capacity on a smartphone out-of-the-box. With so many Android phones in the market, Samsung have to design the Galaxy S3 with some unique selling points/features to differentiate itself. With the tagline: “Designed for humans”, it does deliver some user friendly features. Smart stay is one feature worth a mention, it keeps the screen lighted when the user is reading/viewing the phone. Thus removing the need to constantly keep the finger on the screen and pretend scrolling just to keep the screen on (maybe I’m a slow reader). Coming from a BlackBerry, the notification LED is a nice to have feature on the Galaxy S3 (and also Nexus S). A different colour to indicate missed calls, messages, low battery, etc. without having to turn on the phone screen. A simple yet effective method which I can only hope more Android phones will include. The camera on my mobile phones has always been handy for those special moments. A good quality camera like the one on the Galaxy S3 is easily as good as my point-and-shoot camera for well lighted scenarios. The colours, the contrast, the details were good. But it’s still no where near a proper camera for dark/night scenes, but its definitely among the better quality for a smartphone camera. An enhancement to the previous generation, the Galaxy S3 can now record sharp smooth videos in Full HD (1080p). On top of that, the ability to capture picture while recording video is great. No longer do I need to ponder and switch between taking a video or picture of a particular moment. Like Apple’s Siri, the S Voice feature on the Galaxy S3 doesn’t work as well as I’ve hoped. It does feel like a me-too attempt by Samsung, but until someone manage to improve the voice recognition I’m not going to talk to my phone for task which can easily done faster via the touch screen interface. Lastly, the TouchWiz UI feels responsive and smooth with a “touch of nature”. The unlock screen comes with water-drop sound effect and ripples. Overall, I’m in love with the user experience of the user interface of the Galaxy S3. Perhaps a later upgrade to Android 4.1 Jelly Beans will improve this UI smoothness further with the Buttery enhancement. I guess the Quad-core is more power hungry than a dual-core processor, as the battery life is just a little better than the Galaxy S2 on my normal daily use. I’m probably best categorized as a low to average user on my mobile. Perhaps just some occasional calls (less than 20 minutes), some messages, some candid camera moments, some social media updates and videos (less than 1 hour in total) in a day. The battery could easily last me for 2 days with about 20% left to spare. 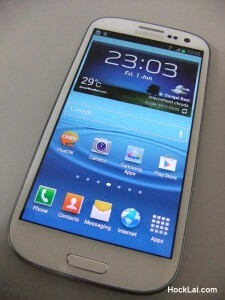 The Samsung Galaxy S3 will be “the” phone for me if I’m going to get a new phone this year (if budget is no matter). Personally, I’m all into Android over the iOS. The Samsung Galaxy S3 has raised the bar for an Android phone, and if Apple’s next iPhone (iPhone 5?) 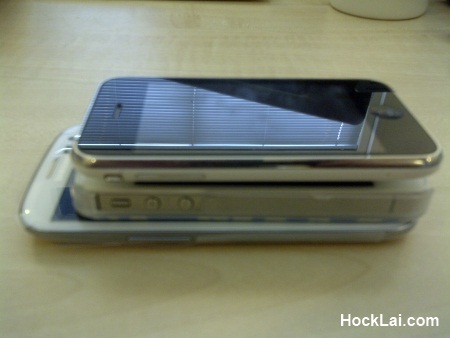 doesn’t raise the “wow” factor like it used to… Dare I say, this will be the best smartphone for 2012.